Remember how I mentioned months ago that we're moving? Well, it's still happening and there's been some exciting progress made recently. We're over the moon excited + can't wait to share the details soon! :) In the meantime, let's talk Ellie's future playroom. We're pretty much bursting at the seams in our current house. Most of Ellie's toys are in the living room, and the rest are in her very small bedroom. I am so looking forward to having a designated room for all of her toys in our new house! I'm sure her stuff will still end up strewn all over the house at the end of the day because that's just the nature of having kids, but I do think it'll be nice to have a special playroom set up just for her. That being said, I want this little space to be 100% kid-friendly - no "off limits" areas, just a room for her to be a kid and do the things that kids do. I've been brainstorming ideas for a while now and here are a few looks that I'm loving! 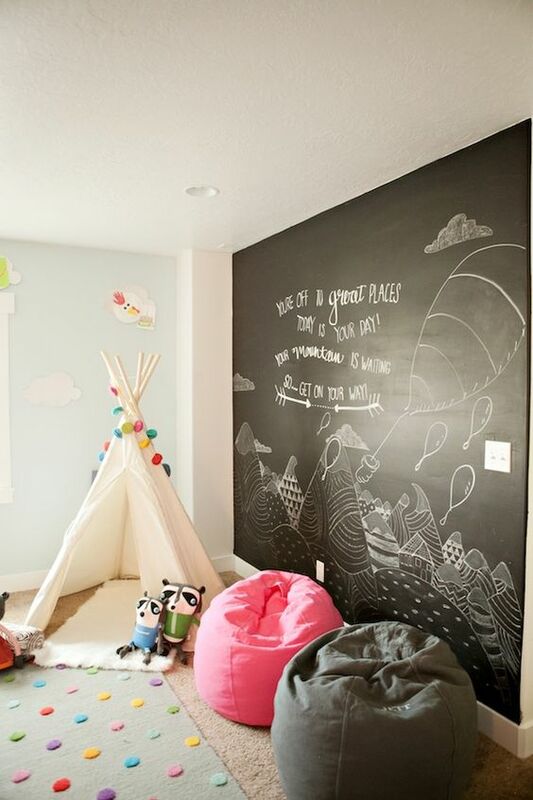 Neutral bases with pops of color, and of course some kind of chalkboard (wall?!) included. I would totally love to hang a swing from the ceiling. Not sure if a certain someone I know and love would think it was as good of an idea is I do though. ;) I was hunting for the perfect rainbow garland and came across this "all the colors" one on etsy - obsessed. Ellie will getting my + my sister's old play table to use in her new playroom! How cool, right?! A teepee is on Ellie's preliminary 2016 Christmas list - yes, definitely already thinking of these things nine months in advance! 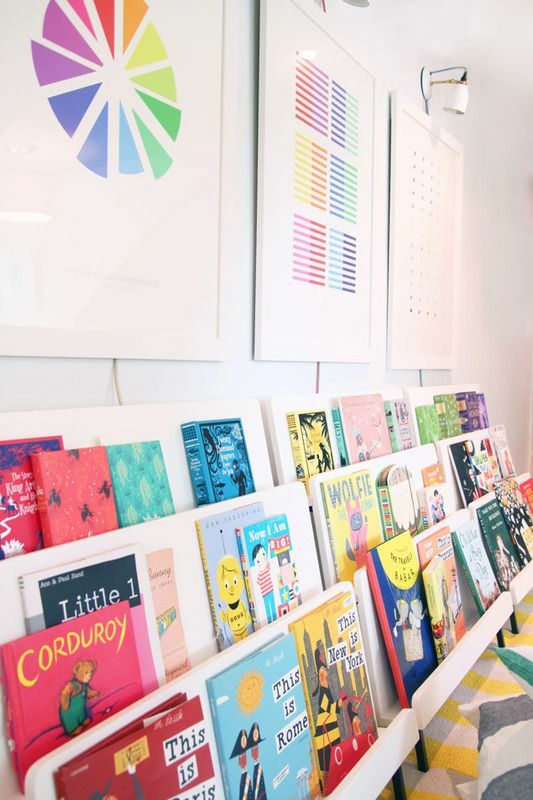 Throw in some comfy pillows + cute blankets, and you've got the perfect cozy reading nook. As much as it can be a pain to keep clean sometimes, I really do love the rug we have in her nursery now. I want to put it in her playroom when we move and get a fresh new one (the same kind) to put in her bedroom. Lots of cute storage is also a must! 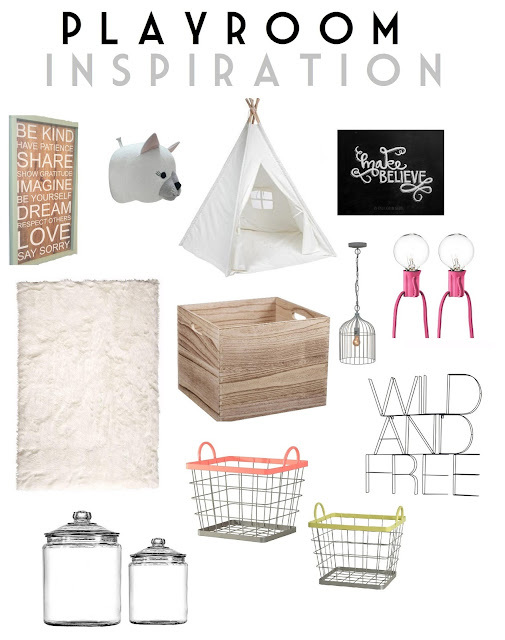 Sometimes just throwing everything in a basket is the simplest way to make things feel clean + less cluttered. This whole playroom is budget permitting and I'm sure will be a gradual project, but a girl can dream, right? ;) Any playroom decor or organization recommendations or inspo you love? Please share! Also, want to see the coolest, most over-the-top playroom on earth that will 100% make you wish you were a kid again? Check it out here!